This is a response to a recent blog entry from Michael Bolton. He challenges to spot as many management mistakes as possible in a short dialog excerpt between a project manager and a tester. I will quote the dialog and walk through each of the problems I can spot. Though asked differently, I will not only mention those problems related to management, but also to the tester there. The manager does not give the reason for this action. He simply states there is the need for the tester. This sets up emotional pressure on the tester, who does not want to let the team fall. I’m not sure if the manager put this up by intention or just by coincidence. Tim on the other does not start to challenge the claim. The project manager simply says they need him, especially. But maybe another tester could do the job. What’s his mission? How long should he test? To whom should he report his results? Who is the client? Instead, he simply asks from the personal perspective, which might indicate an emotional reaction to the claim from the project manager. So, let’s look how the manager responds to this. The build is a replacement for a broken build. The programmers seem to have produced some lousy work the last time. Now, that’s interesting information. Despite this valueable information, the manager seems to rely on the facts as counted by the numbers. There seems to be some corporate metrics program, that let’s this manager look more particularly on the number of bugs fixed than how many further bugs could have been introduced by fixing those. Again, this information is available in any bug database, but the manager simply ignores this valueable information. Last, but not least, his interpretation in the last sentence indicates that “more bugs fixed” means “harder worked”. This mustn’t be the case. Another point that Jerry Weinberg made me aware of, is the fact, that there is nothing stated about how many incidents correlate to the mentioned bugs. There could have been 10 bugs fixed by a single code line change. Similarly there could be a single bug which needs fixing in several components. The numbers alone lie here. A final point: The manager should know if his programmers have worked hard , if he would have paid attention to what they were doing rather than looking at the numbers, only. Tim clearly should know better here than to give in to the manager. The developers mustn’t have worked very hard as pointed out before. Tim could know this better, if he paid attention to the past of the project. Just by stating that the only outcome here is that the developers were working hard, he proves his manager correct – in the manager’s eyes. If you believe something hard enough, your mind makes it a fact. This is inattentional blindness. Of course the developers did not test, how could they deliver that many fixes otherwise? There are several pointers that this managers ignores relevant information. He doesn’t know if they tested their code, the build prociess is unstable, but that doesn’t give him a clue, either. In combination with the Assurance Fallacy of Testing (“You’re quality assurance, … It’s your responsibility…”) there really is more need to fix bugs, than to fix them properly. Of course, the build process crashing all the time could indicate a problem in the quality of the code these programmers seem to produce. When someone is arguing irrationally, don’t try to argue with logic. “I know that you have many duties as a project manager, but doesn’t the broken build process point out, that there might something wrong?” could be a response to get the attention of the manager back to quality rather than delivery. The hidden message Tim wants to send here just doesn’t work in this context. Without knowing this particular project manager for sure, I sense that he is basically just trying to sell the idea on testing to this poor tester. For any reasonable tester it’s obvious that he does not know anything about testing at this point. Instead, by giving kudos (“expert”), he tries to let the tester feel comfortable. This is the “washing machine selling management”. In this style management acts as if they were selling you a washing machine. Here, the selling involves the tester to be the right person to do overtime on the weekend. Anyone who thought about testing at least a tiny bit, should get to the conclusion, that testers don’t assure any code quality. But as pointed out, the manager simply wants to get this tester to work over the weekend by sacrificing even his own credibility. This is a brilliant idea. Let testers and programmers work together to fix the team problem, help programmers get started with unit testing and the like. Too bad his claim is interrupted here by the manager, thereby undermining the testers management capabilities. Of course, the tester shouldn’t make suggestions on how to manage the project here. At this point, the manager fires back by telling the tester how to test. Personally, I think this is a response to the tester’s attempt to manage the project. Of course, the fallacy of testers interrupting and interfering with the development is inherent here. Testers help developers get going. If the priority is to fix the bugs, rather than to fix them properly, then it’s more important to get some software. If the software does not need to work, I can hit any other requirement (The Zeroth Law of Software taken from Weinberg’s Quality Software Management Volume 2). Noticed that this manager does not even let the tester finish? Again? This indicates that the manager does not have any interest at all to get to know what the opinion from his tester is. It’s more important to have him working on Saturday. Opinions do not count. In addition. he puts more pressure on the tester here. The schedule is of course pressuring this manager, but it’s his job to manage to get a quality release. In addition his claims in this response are not congruent to his earlier message. He cares about quality from the tester, but not about the quality from this who arrange quality in the code itself. This is ridiculous and I really do not want to be in Tim’s situation at this point. The manager again tells the highly-educated tester what he has to do. Mary Poppendieck explained to me that this is really a problem. Once again the manager is ignoring the facts. Every “code drop” has had problems in the past. So, where are the code reviews? Where are the unit tests and walkthroughs? Where are the design reviews? Given the information the manager seems to have, he could really do better. This response again is good, but he could do better. Telling the manager that the problem indeed might be in the way he manages the project with the information at hand, is ridiculous. The Candidate Product Rule says, “Actually, it ain’t nothin’ ’til it’s reviewed” (Weinberg, QSM Vol. 2, page 290). This manager seems to manage by the rule, that it’s nothing until it’s tested, but we can skip review easily. The claim Tim makes here is still valid, but he doesn’t respond to the things Magnus just raised. He could bring his point out more clearly by doing so. Ah, the common time creation myth. Time is not created, you have to take your time. Especially for quality products there is no free lunch. You have to plan accordingly, incorporating the time it takes. The problem that the project is already over estimate, might as well depend on the manager of the project. And the manager is falling for the test phase fallacy. Testing is not a phase, bugfixing might be. Last, not adapting to the project as it unfolds by creating new test cases may as well produce the problems of tomorrow. This vicious cycle the Magnus manages to get in here is very common. Well, the claim from Tim to do some exploratory testing to fill the gaps for the uncovered areas is great. Magnus’ response to it is fatal to the project. Again the project manager does not adapt to the situation at hand, after the project started to unfold itself. By getting risk-averse coverage of those areas which are not covered by the initial test cases, the manager sets himself up for tomorrow’s problems. Oh, and of course, it’s better if the customer finds the bugs, rather than have the programmer fix them now before the loss of reputation. Last, but not least, exploration isn’t a luxury, neither is testing itself. They’re both a necessity for quality software. Skipping either or both is not only undermining testers’ efforts, but also comprising developers who very well observe what managers do and don’t do. Finally, the manager has misunderstood Agile in the sense to develop software without the weight of documentation, but has not understood that Agile development needs a team. By separating the testers from the developers the manager undermines every benefit he could get from really doing Agile development. If it’s natural for Tim to come back all the weekends, he will be asked again. Of course he shows his struggle during this conversation, but it’s really for the manager to influence to get what he particularly wants him to do. Again, in the example stated, the manager ignores very well information which is available to him beside the information he gets from the testers. The pointer to “bad luck” just reminds me on Weinberg, who stated to replace the word “luck” in the phrase with “management”, when a managers refers to bad luck. We might as well prey to the software gods, if a whole company can be built upon management by luck. Of course, the manager’s claims about commitment and can-do organization are just institutionalized to make his argument and get Tim motivated. The problem lies in the decrease of motivation after this conversation. Tim’s trust for proper management has surely decreased, and a few more of these instances may let Tim leave the company searching for a better job opportunity. Finally, Tim gives up. Never do this, though it might mean to continue fighting for ages or to lose the job. This is ok, as you didn’t like the job, anyways, now do you? That’s my more elaborate response to Bolton’s challenge. Now, which parts did I miss? In yesterday’s European Weekend Testing session we had a discussion upcoming on whether or not to follow the given mission. The mission we gave was to generate test scenarios for a particular application. During the debriefing just one group of testers had fulfilled this mission on the letter generating a list of scenarios for testing later, the remaining two had deviated from the mission and tested the product, thereby providing meaningful feedback on the usefulness of the product itself. Jeroen Rosink already put up a blog entry on the session. He mentions that he define his own mission, and that it’s ok to do so during his spare time. As mentioned I made my own mission also. I believe I am allowed to it because it is my free-time and I still kept to the original mission, define scenarios. for me the questions mentioned in the discussion were a bit the scenarios. Of course, Jeroen is right, and he provided very valuable feedback in his bug reports. But what would I do at work when faced with such situation? Should I simply just test the already available application? Or should I do as I was asked? Well, it depends, of course. It depends heavily on the context, on the application, on the project manager, on the developers, on your particular skill level, maybe even on the weather conditions (nah, not really). This blog entry discusses some of these aspects I did not want to include generally in the chat yesterday. One week earlier, Michael Bolton attended our session. He explained his course started with building a model of the application under test. Then he started to exercise the product based on that model thereby refining his own mental model of the application. Jeroen had picked this approach. He also built a mental model of the application and went through the application with the model in order to refine it. On the other hand, Ajay Balamurugadas had build his model and translated that model into test scenarios completely. To be clear here, both approaches are reasonable. Indeed, knowing when to use which is essential. The software engineering analogy teaches us, that we have to make decisions based on trade-offs. 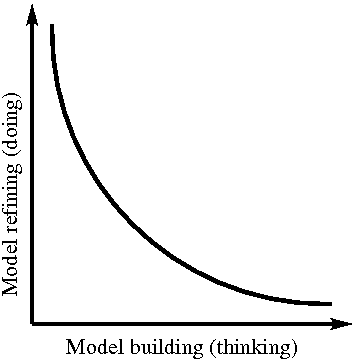 The trade-offs at play here are model building (thinking) as opposed to model refinement (doing). The more time I spent on thinking through the application in theory, the less time I have during a one hour session of weekend testing to actually test the application. On the other hand, the more time I spent on testing (and the more bugs I found by doing so), the less time I can spare to refine the model I initially made. Knowing the right trade-off between the two is context-dependent. I summarized this trade-off in the following graph. In software testing there are more of these trade-offs. You can find most of them on page four of the Exploratory Testing Dynamics where exploratory testing polarities are listed. Thanks for Michael Bolton to point me out on this. Basically, the main distinction between the two missions followed is the fact, that Ajay used all his imaginary information available to build the model for test scenarios, while Jeroen questioned the available product to provide him some feedback on the course. While, we may not have an application available to help us making informed decisions about our testing activities, the situation in the weekend testing session was constructed to have a product in place, which could be questioned. Indeed, for software testing it is very vital to make informed decisions. The design documents, the requirements documents, the user documentation rarely satisfies our call for knowledge about the product. Interacting with the product therefore can reveal vital information about the product and its shape. Gathering information in order to refine your model of the application at hand. Of course, for very simple applications or for programs in areas where you are an expert, this may be unnecessary. Again, the contextual information around the project provides the necessary bits of information about which path to follow. You should take responsibility for the outcome of every decision you make. Since we’re more often than not the professionals when it comes to testing software, we need to inform our customer and our client about deviations to the original missions. We have the responsibility to explain our decisions and to make a clear statement that it’s unprofessional to deliver non-tested software, for example. Of course, they might overrule your decision, but by then they’re taking over the responsibility for the outcome themselves. Of course, just because you lost a fight, this does not mean, that you should give up to raise your point and lose the battle. Last, but not least, I hope that the other participants, Vijay, Gunjan Sethi, Shruti, do not feel offended, since I just mentioned Jeroen and Ajay here. They also did a great job of testing the product, of course. During a workshop at 8thLight Justin Martin collected assets of a software craftsperson. He published these on his apprenticeship blog, and I found the list compelling for some extensions. As I went through the list, I noticed that I included most of it in my article Software Testing Craft in the first issue of the Agile Record magazine. Always brightening everyone’s mood with your love of what you do. Deliberate practice and the enthusiasm to learn something new anywhere are at the heart of my craft. I seek learning opportunities for testing, such as testing challenges, Weekend Testing or Testing Dojos, as well as Coding Dojos, Coding Katas, and Refactoring challenges. Skimming code to seek improvements has become as vital to me as testing a new application for flaws that may bug me later. The life of a software professional is a daily learning opportunity, if you’re open for it. Especially if you feel rushed, or have bitten off more than you can chew. Everybody tries to be helpful, all the time. Indeed, Jerry Weinberg pointed out in Becoming a Technical Leader that being helpful is a key for becoming a motivational leader. That said, there are two sides of the medal: being helpful and asking for help. In a helpful environment it’s easier to ask for help. But don’t shrug in the non-helpful environments, either. Don’t be afraid about saying “I don’t know”, since it’s vital to know what you don’t know. If you do know what you don’t know, you also know when to ask for help. Even if you are already a Craftsman, if you are surrounded by other Craftsman, there will always be new things to learn. There is a direct connection to the previous point. Asking for help is a special case of asking lots of questions. By asking questions, you start to reflect over the course of what you perceived. Over time, when you get helpful answers on your questions, you are able to learn from the answers, and grow. This is called expertise or experience. By constantly questioning not only the technical facets, but also the process aspects of your work, you develop yourself as well as your mind. The mark of a Craftsman is to have an unfailing discipline to do the right thing. Whether that is constantly learning new things, or never forgetting what you know, especially when it is hardest to practice. Discipline is a key to successful learning. Giving in to feelings of pressure or mistrust is the pathway down to suffering. You need discipline to stay on your course and pursue it. Leaving the safe ground means to go awry. Discipline itself can be separated into three basic components: going slow, doing it right, and being methodical. Often it is better to take your time, making sure you do every step correctly, rather than rushing for a temporary spike in productivity. Going faster by going slow, sounds weird, but it’s the paradox key to success. Always remember that typing is not the bottleneck, otherwise we could simply pursue faster keyboards for you. Giving your mind the right amount of slack, saves you from paralysis. Rushing something to success is merely the solution of a novice. Taking the time for steady progress now, rather than a full bloat of erroneous features that you need to fix later, will not help in the long run. Never stop practicing the things you know that work. Don’t stop testing first. Don’t stop refactoring. How come we always have the time to do it over, but never the time to do it right? Going slow is the first step in order to make it right. If the software does not work, you can hit any other requirement, but it’s the “getting it to work” that’s the hardest part. Similarly, if your suite of automated checks has a lot of false positives, that is tests that pass, though they shouldn’t, then you will never know whether you can successfully deliver your software, or not. Make the tests and the checks right, or don’t make them in first place. Anything worth doing, is worth doing it right. Be thorough. Be certain you are producing the best work that you are capable of through a steady and unflinching practice of virtues. Taking the time, and making it right, are the first steps in order to being methodical. If you give in time pressure, you are less likely to work methodical and might fall back to cowboy-coding. This does not help. Instead, remember what you learned, the TDD-cycle, the ATDD-cycle, don’t try to run before you walk. Through this you will reach steady progress that helps you and your customers. A Craftsman knows his own productivity, and can gage how much he can get done in a certain time span. Making lists, getting metrics, and measuring your productivity will help to accomplish this. The heart of Agile is to make progress visible. Measuring anything worth measuring, in order to prepare an informed decision later. Craftsmanship takes this a step further. In order to know how much effort a particular project may be, you need to have data from your past. Creating lists based on past experiences may help you with this. Over time you will be able to see patterns, and might no longer find the lists useful. By then you may have reached a new level of mastery – the Ri-level in the ShuHaRi model of skill acquisition or the Expert stage of the dreyfus model. It is important to remember you aren’t just writing code to fulfill some requirement on a note card, but you are actually creating a product that a business intends to use. Try to understand what that note card means to them as you transform the requirement into a feature. In order to do the right thing, you have to know what the right thing is. Understanding the business behind your work is essential for any knowledge worker. This includes developers, testers, business analysts and technical writers. Without the vision of your work, you’re doing useless work. Remember the Product Principle from Weinberg’s Quality Software Management series: Anything not worth doing, is not worth doing right. Since you’re doing everything right, avoid doing anything not worth doing in first place. Of course, in order to make this decision, you need to know what your customer’s business is asking for. Recognize your failures of the past so that you can move forward on a new level. Taking the time for reflection is essential. Self-blindness about own failures does not help you grow. Therefore seek opportunities to realize your failures and learn from them. We all make errors at times. The aspect that makes us human, is the fact to learn from our mistakes. Throw your ideas out there, and then be the biggest critic of them. You only stand to gain when others see your ideas (unless youzz crazy). Sharing your ideas is essential for the community to grow. Pay back what you get from the community by bringing in your own ideas. Of course, they might be subject to critics, but these critics will help you grow, learn from the mistakes you make, and contribute to your professional growing over time. If you’re shyly hiding your ideas in your mind, they’ll be gone when you’re gone. The other way round they may even survive. Stay positive, because if you are getting punished by your mistakes, remember that you also learning from your mistakes. There is no such thing as a free lunch. At times you will wake up and see you have painted yourself into the corner. It’s essential to take course corrections at that time, though this might mean to switch your jobs. It’s a worthwhile lesson, but it has to come at a price. At times, you may have difficulty paying the price, though it’s the most sane thing to do. Remain positive about these changes.